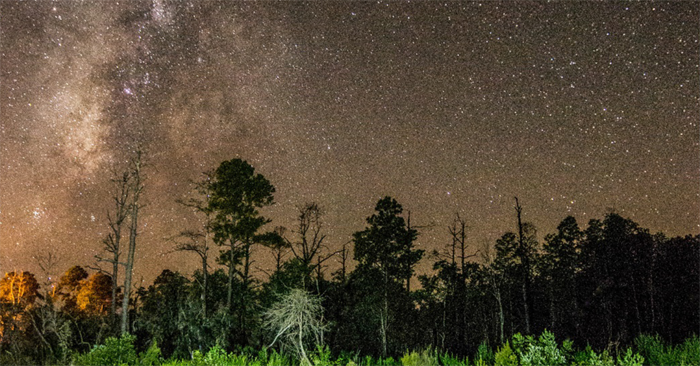 IDA has designated Stephen C. Foster State Park in the Okefenokee Swamp of southern Georgia, U.S., as a Gold-tier International Dark Sky Park. The park’s new status makes it the first place in the state of Georgia to receive accreditation as part of IDA’s International Dark Sky Places Program. Stephen C. Foster is at the western edge of the 400,000-acre Okefenokee National Wildlife Refuge in the sparsely populated southern portion of Clinch County, Georgia. The Refuge protects about 93% of the the largest blackwater swamp in North America, among the oldest and most well preserved freshwater areas in America. It is located near the city of Fargo, which has just over 300 residents and few businesses. The park staff applied for the designation after months of preparation, including the removal of 13 street lights and switching many bumps to directional LED lighting. Also, the staff worked with the local electrical co-op to install lighting that shines downward rather than outward and installed motion activated sensors on outdoor lighting at the park’s cabins. The park offers astronomy programs throughout the year with its 8-inch and 10-inch telescopes. Michael Ellis, a former interpretive ranger at Stephen C. Foster, led the effort to obtain the IDA designation. “We are proud to have earned this prestigious designation and bring attention to the issue of light pollution,” Ellis said. Ellis, now assistant manager at Reed Bingham State Park in Adel, Georgia, will be back at the park when it celebrates its new designation on December 10 with a short ceremony and an evening astronomy program. Barring clouds, visitors will be able to observe the moon’s craters, Venus, Mars and the North Star during the program. To learn more about the park and its programs visit the park’s website or call (912) 637-5274. Previous post: Get Your 2017 IDA Calendar!